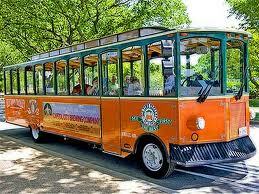 The above photograph of a Washington DC trolly bus was the bane of my existence at the TEDMED conference I attended. The conference itself was an amazing experience. It was nothing like the anthropology conferences I have been attending since I became a professional anthropologist. Anthropology conferences are bare bones. No swag, sub basic speaker set ups at mid line or cheap hotel/conference centers. Well, last week I learned how the other half lives. I have no idea how much money was poured into the TEDMED conference but it was substantial. And this I suppose reflects the significant sum of money people invest in attending. While I did not shell out anything to attend thanks to the Hastings Center that got me a scholarship, others forked over $5,000. What does this money buy a delegate? Access to the Kennedy Center, a social hub in the form of a huge tent--think circus sized tent, dinner at the Library of Congress, excellent food, meaning breakfast lunch and dinner, and an open bar in the evening. It was the open bar that shocked me. An open bar and anthropologists is a bad mix. Think stupor here! While I could wax poetic about the facilities and speakers there was one glaring flaw--transportation in the form of buses from my hotel to events all over Washington DC was problematic at best. And here I am being far too polite. Transportation was a disgrace, totally unacceptable. Prior to attending the conference I inquired multiple times about accessible transportation. The first reply was typical. Of course we have accessible transportation. When I inquired as to what that accessible transportation entails I was informed "some buses" have wheelchair lifts. At any other conference I would have interpreted "some buses" to mean you are on your own. We have an accessible bus but have not seen it since the Nixon Administration. However, given the conference was a TEDMED event I had higher hopes and expectations. I will say this about the buses. I was able to get to every event. That is as far as my praise can go. By itself this is an indictment of just how bad bus service is in America for people with a disability. What I was told before I left for Washington DC was correct. Some buses were accessible. Not many, but some. If each and every bus that had a lift operated and the driver knew how to use the lift I would have experienced minor inconvenience. But as most people that use a wheelchair know just because a bus has a lift does not mean it works. I would estimate half the wheelchair lifts on "some buses" were not operational. This transformed my transportation experience from being a minor inconvenience to a major problem. What problems did I encounter? The usual excuses abounded: "the lift is broken", "the key is missing", "I don't know how to use it", "the tie downs are gone", "I don't know how to use the tie downs" etc. At any other conference or tour of the city this would be expected. But we are not talking about any other conference or city tour. Major funding goes into the TEDMED conference. It is a spectacular conference, speakers uniformly superb, polished even, and all other events were extremely accessible. The Kennedy Center was a delight, bathrooms abounded, staff helpful and professional. By the end of the second day I realized two things. One, at least two buses and as many as six would pass me by before I could get on. Some accessible buses became a lonely singular bus. I lost a great deal of time simply waiting and watching other delegates get on and off bus after bus after bus. This did not seem to bother any delegate or employees. Second, the transportation supervisor lied to me and was willing to say anything to get me to stop complaining. After watching many buses pass me by I confronted her and told her each and every bus with a lift had to be tested before it was put in service; and be tested by the driver. She said of course we do that. The next bus arrived and the driver told me he had never used a lift a before and had no idea how to operate it. I quickly learned the transportation supervisor was worthless. The actual drivers were the one's to know. In the end I was able to manage and did not miss any event. However, if I had trouble at a prestigious conference such as TEDMED what takes place at an ordinary conference? What happens to the average tourist with a disability who tries to use a trolly bus? These question make me think back to 2004 when my son and I tried to visit the new Air and Space Museum outside Dulles Airport. Just like I experienced at the TEDMED conference, the bus had a lift but it did not work. Eight years later it appears not much if anything has changed. Lip service is paid to accessible transportation. Try and use those pesky lifts and a new harsher reality emerges. I am in the middle of writing an article for I Live With a Disability.com regarding the stigma, isolation and difficulties PWD still face 20 years after the ADA has been passed. As your piece on the TEDMED transportation issues so eloquently illustrate a key point as to how PWD are isolated; I would like to ask your permission to link to your article in the piece I am writing. Nessie, Of course you can link to my post. Let me know when your article appears. Mass transportation remains problematic at best for people with disabilities. Tedmed was just a microcosm of the issue. Ah, getting around in a wheelchair in DC is not much fun. I'm reminded of back when I was using a manual wheelchair and trying to catch a cab. It was over 100 degrees, humid, and ironically I was in front of the 23 steps into the American Institute of Architects national headquarters. Over 90 empty cabs passed me by. It was a defining moment. Anyway, was there anything at all about disability, either good or bad, at TEDMED? The general TED conference seems to live in a world without disabilities--except for cool-looking prosthetics. Anthony, Bus service in Washington DC is a disgrace. Cab service is not much better. Had lots of trouble with a cabbie. TEDMED and the TED Talks are separate entities. The man that founded Price Line now owns TEDMED. It is a for profit entity. Disability was a subtext. Few papers touched upon it explicitly. I think being telegenic is a requirement for TEDMED speakers. And as we all know disability is not perceived to be attractive. I am going to write a review for New Mobility. It is disgraceful.... ridiculous... that the conference organizers didn't arrange accessible transport for you while flinging money in every other possible direction. Liz, Access was surely a consideration. No doubt about that. I have no doubt when meeting with the bus company before the event TEDMED was assured the buses were accessible. And in theory they were accessible. But the difference between theory and reality was significant. Another variable was this is the first TEDMED conference in their new home. Errors are bound to happen. The real measuring mark comes next year. If I am able to attend and the bus service is abysmal again blame will rest with TEDMED alone. The article in which I linked to you is finally up at I Live with a Disability.com. Its title is Disability Discrimination: A Thing of the Past?